Warm and wonderful. A film that endears with laughter and tears. As a reviewer there are many criteria with which to critique a film, but ultimately, the final decider is how it makes you feel. For instance a film that literally keeps my mouth in the shape of a smile for the duration -- now that�s a good film. This picture kept a tear in the corner of my eye even while tickling me with its humor. Heart-felt endearment and big belly laughs -- where else can you find those two fortunes in the same two hours? This is a rich script that explores a young man�s internal struggle to come into his own. It�s his plight to rise up over the looming weight of his father�s death at a crucial time in his growing up. His Minneapolis based group of friends are brought to life with an authenticity not usually found in the average �movie buddy� gang. Each friend is written well and acted well. They�ll feel like your friends. Juliette Lewis is especially sparkling as the woman who won�t settle for settling. All in all, I really liked this movie. Its big warm heart shines strong through the celluloid. It�ll bring a tear to your eye, a chuckle to your belly, and good circulation to your day. Aurora Borealis. Copyright © 2006. 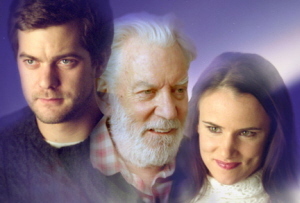 Starring Georgie Joshua Jackson, Donald Sutherland, Juliette Lewis, Louise Fletcher, Steven Pasquale. Directed by James Burke. Produced by Scott Disharoon, Rick Bieber at Entitled Ent.